I won’t bore you with how ridiculously busy I have been, rather I will just try to catch up. The latest finished project? 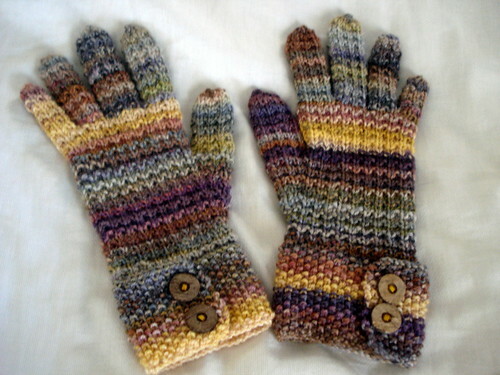 These awesome gloves from the latest Knitty.com issue. Ringwood Gloves. 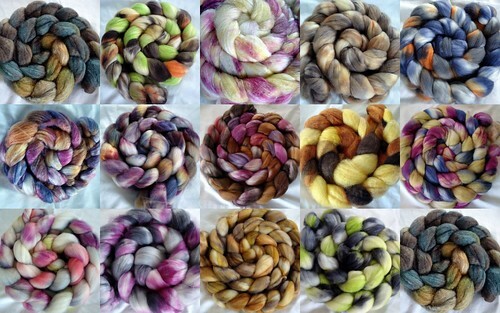 I knit them in handspun from JulieSpins 75/25 BFL/silk fiber. A truly luscious blend that is soft with a bit of shine. 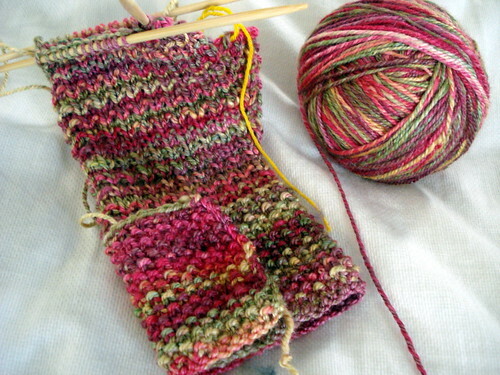 I have ridiculous love for these gloves and already have another handspun pair on the needles. And continuing on the BFL/Silk bandwagon-here is the first finished skein of JulieSpins BFL/SILK in “Stained Glass.” I have four braids of this and it is earmarked for a “simple tunic sweater” for my mom. If I hope to finish it by Christmas (which may be very wishful thinking!) I thought I better get spinning. I also finished this BeeMiceElf handspun sweater. 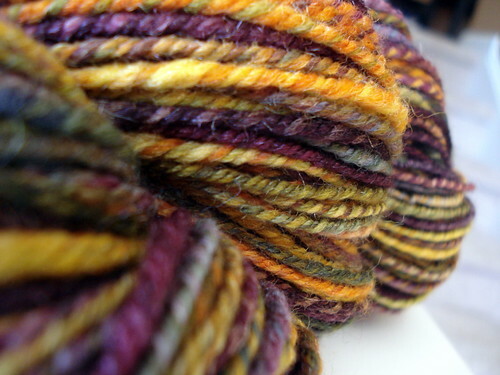 This is the December 2009 club colorway “Around the Mulberry” in 80/20 merino/silk. I still need to spin the 3rd braid and fix the hem & neckline. It needs to be a bit longer with a non-rolling hem and the neckline is too wide, it falls off my shoulders. 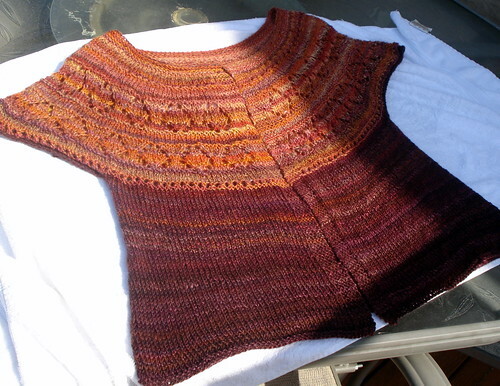 I do have a finished object to share. 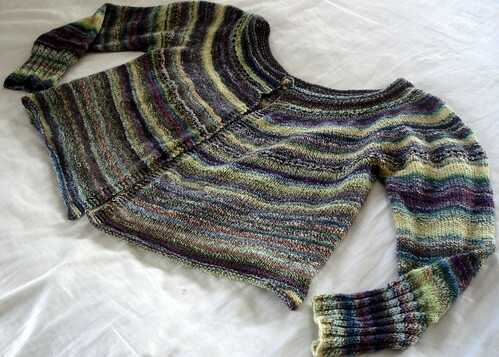 This is the Tappan Zee sweater from the latest issue of Knitty.com. 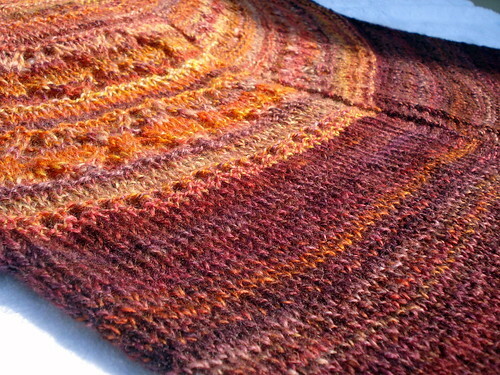 I knit it using the BFL from JulieSpins in the unclub colorway “Autumn Glory”. I had just enough to finish, with about 3 foot of some Malabrigo sock yarn used for the last 20 stitches on the bind off. 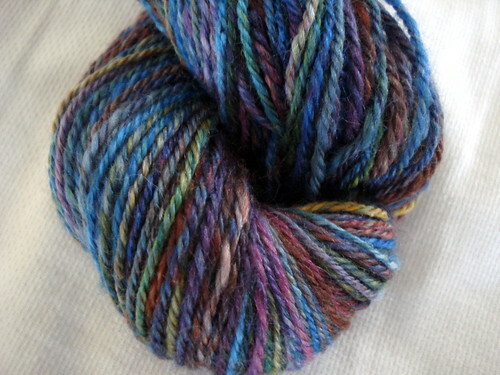 Still, what a cool little sweater for only 648 yards of handspun! I am still contemplating the closure. I am actually toying with a zipper or perhaps a crocheted frog-type closure that echoes the diamond pattern of the yoke. The color combination worked out perfectly with the lighter colored skein ending just before the end of the yoke (You can see one or two rows of the darker edging the sleeves). 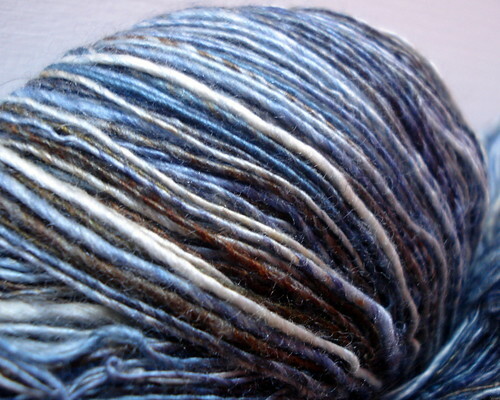 I am finishing up some yummy Enchanted Knoll Farms Bliss (65%merino/35% silk) today. It spun like a dream into teensy-tiny singles. I am plying it into a laceweight and it is coming out amazing! But I am blogging. Heh. Things have been a bit hectic, we were in Asheville NC last weekend for a legal seminar and kids are shuffling for spring break. My Mother in law arrives today which brought about a flurry of spring cleaning. In the meantime, I am still slogging away on the baby blanket Girasole. 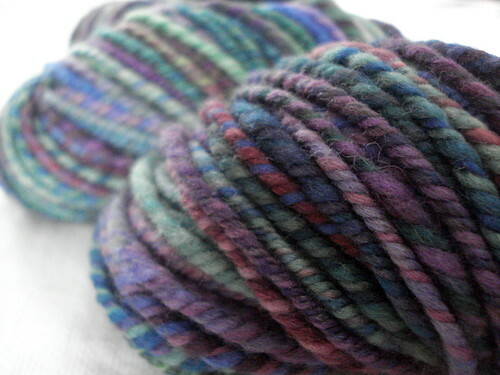 I love, love, love the pattern & the gorgeous JulieSpins merino I have spun up to knit with. Unfortunately, I ran out of yarn-yep-I actually started knitting before I finished spinning. Huge mistake. But more fiber is jetting towards me as I write this, so all works out in the end. Even for schmucks like me who do silly things. 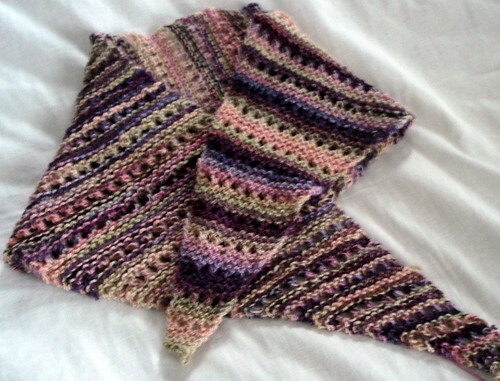 I would post some in-progress photos but it is a circular blanket & it just looks weird on the needles. I also cast on for a little short-sleeved cardigan from the new Knitty using the JulieSpins Autumn Glory BFL I spun up for Ravelmpics. It is color progression yarn & I started the yoke with the lighter skein. Now that I am knitting it I think I probably should have started with the darker skeins then fade to lighter towards the waist, but eh…who knows. Progress pics on that soon. 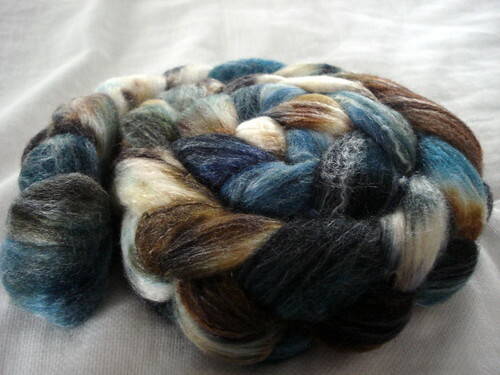 I started spinning the March Funky Carolina fiber last night. 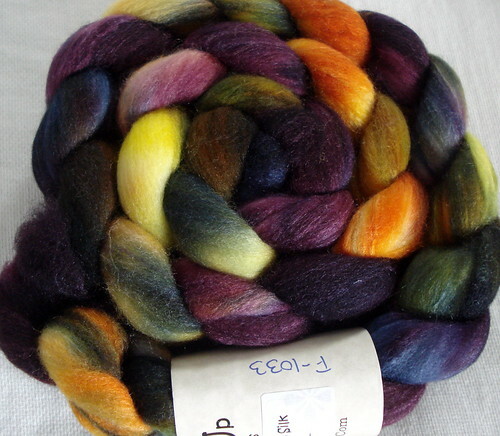 It is merino/bamboo/silk and it is quite luscious. 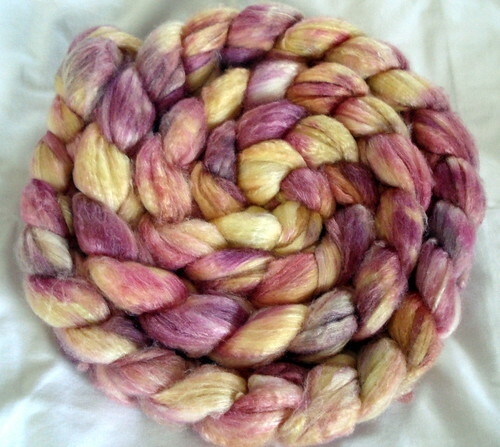 I am thinking a plied laceweight. 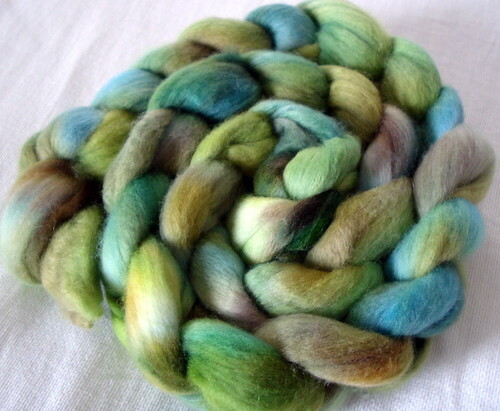 A before picture of the merino/bamboo/silk yumminess! I forgot to shamelessly post my completely Lacey Baktus scarf I finished over Christmas. 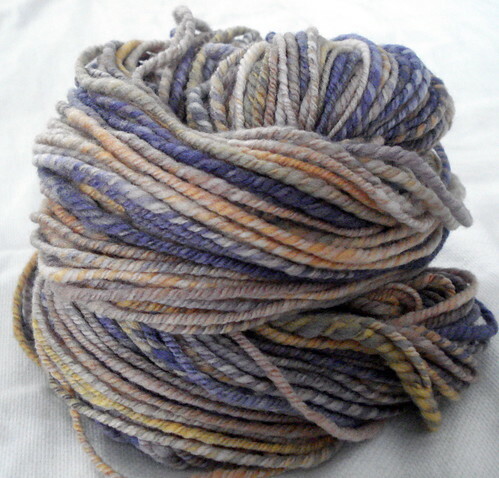 The yarn is my handspun BeeMiceElf merino in the Floribunda colorway. I actually had this yarn listed for sale on the etsy shop (www.micamynx.etsy.com) and then I took it down so I could knit it up! I think that may be my modus operandi-maybe I will start listing everything and if it doesn’t get snapped up, I will unlist it & knit it at will! This yarn striped beautifully at the beginning, but once the stripe mojo left, I couldn’t get it back. It still turned out to be a killer little scarf though! I love it! 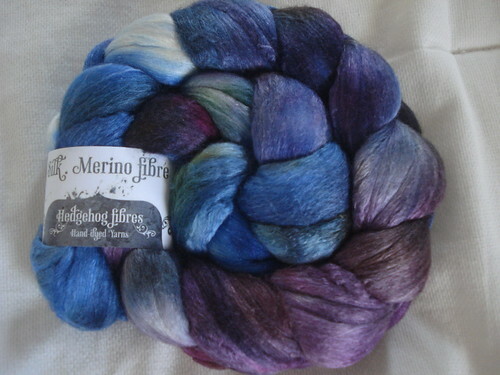 Laceweight singles from this scrumptious Hedgehog Fibres (www.hedgehogfibres.etsy.com) 50/50 merino/silk combed top! It is rapidly becoming a Bitterroot shawl (http://www.knitty.com/ISSUEwinter09/KSPATTbitterroot.php). I am trying to finish it before I leave for Mexico, because I desperately want to wear it in Cabo, but I don’t know if I will make it or not!